715 N Graham Street #602, Charlotte, NC 28202 (#3438587) :: Robert Greene Real Estate, Inc.
You've never seen the Garrsion like this! 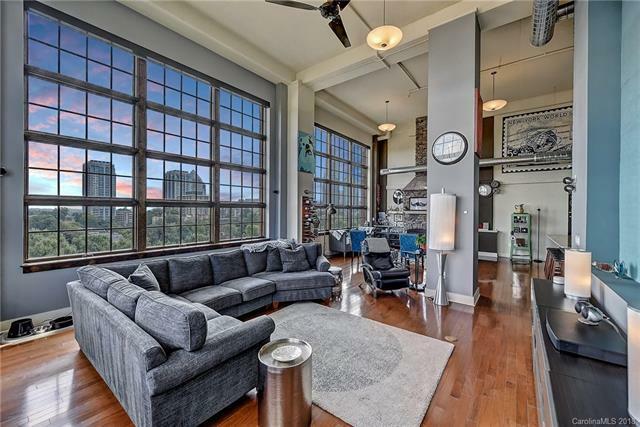 A rare opportunity to own an oversized top floor corner loft in exciting 4th Ward. Character and sophistication are showcased by the brick accent wall, dramatic high ceilings, walls of shop style windows, hardwood floors, and tranquil city lights views. Kitchen offers gas cooking, massive conversation island, custom backsplash, granite c-tops and stainless appliances. Clean modern lines and clever use of space blend a historic feel with modern living. Community rooftop terrace just down the hall offers dramatic long range views of the skyline, outdoor kitchen/bar area, gas fireplace and seating areas.